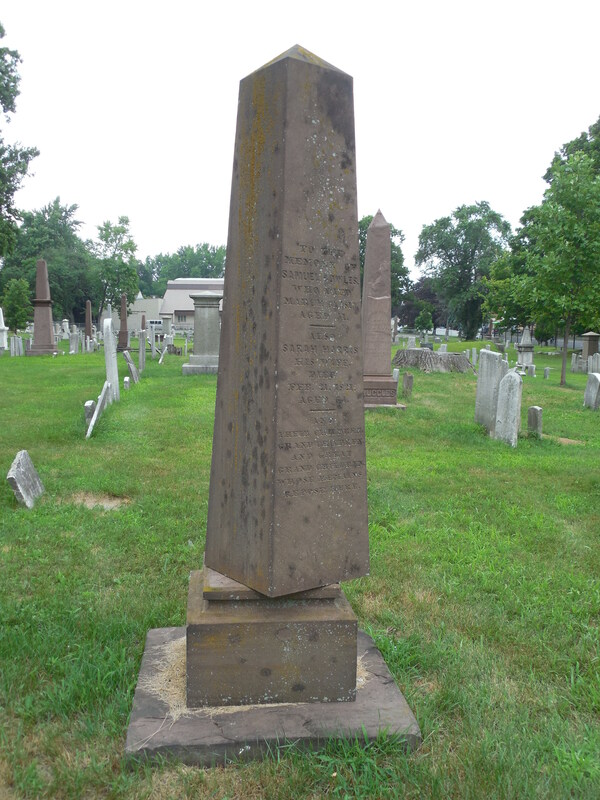 4.1.00 Mary Rider Marker, 1845, Wooster Cemetery, Danbury, CT. Thin marble marker with stainless structural support. 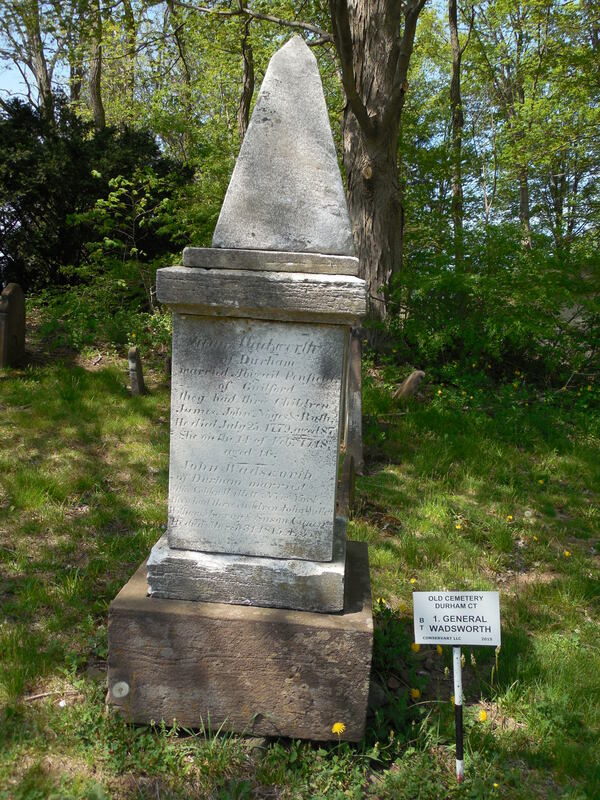 4.1.0 Mary Rider Marker, 1845, Wooster Cemetery, Danbury, CT. Thin marble marker with stainless structural support. 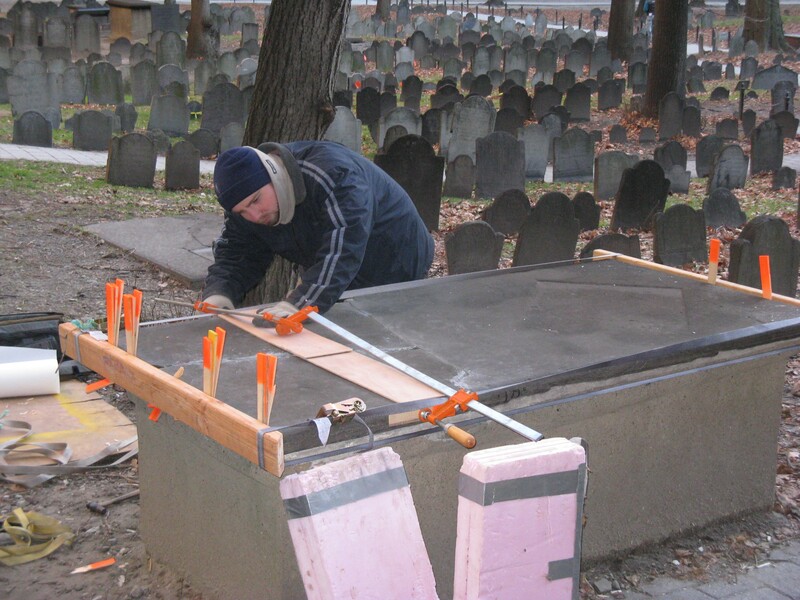 4.1.1 Dorchester North Burying Ground, 1634, Boston, MA. Overview of the cemetery during conservation treatment. 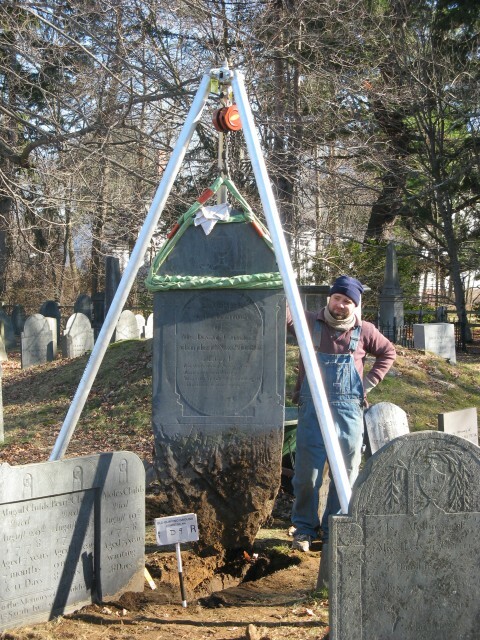 4.1.2 Ancient Burying Ground, 1640, Hartford, CT. Assessing monuments and markers. 4.1.3 Granary Burying Ground, 18th Century Slate Crypt, Boston MA. Mending fragments on the broken top slab. 4.1.4 Jacob Smith, 1699, Granary Burying Ground, Boston, MA. View of the repaired slate with a replacement slate base. Williams Family Cemetery, 1690, Providence, RI. 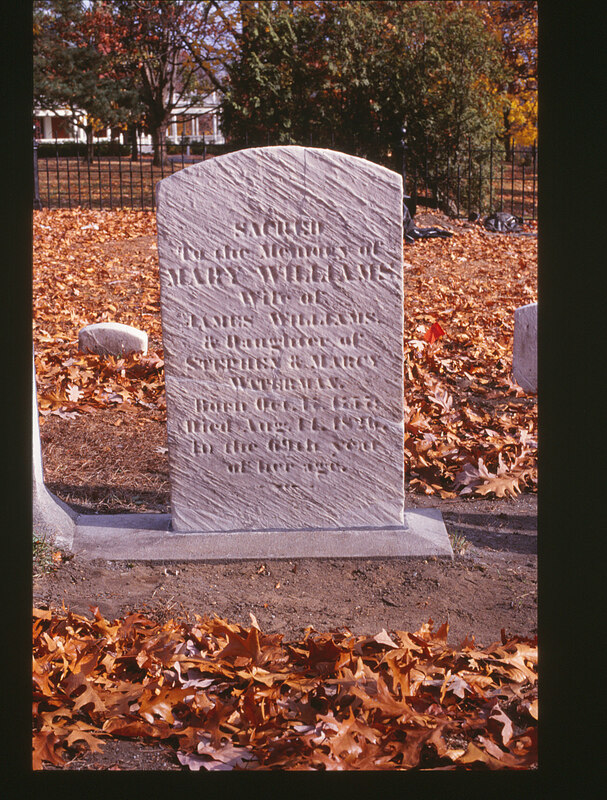 4.1.7 Mary Williams marble marker, 1826, Williams Family Cemetery, Roger Williams Park, Providence , RI. Overview of headstone after treatment. 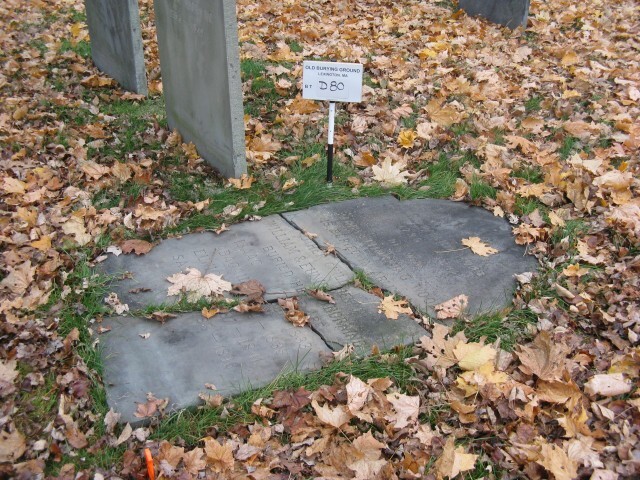 4.1.8 Elizabeth Green, 1750, Olde Burying Ground, Lexington, MA. 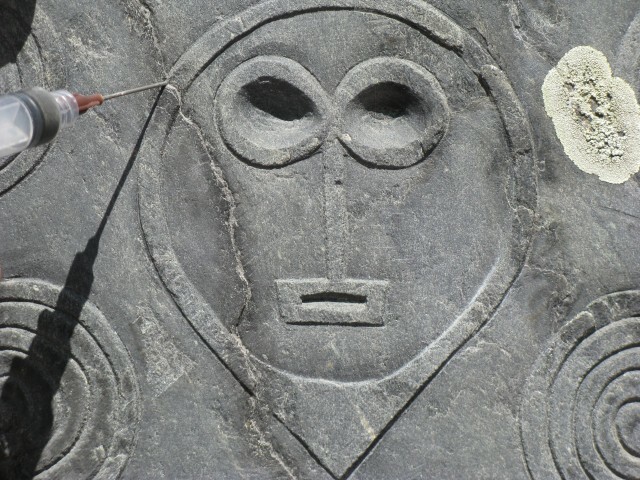 Injection of colonial slate marker. 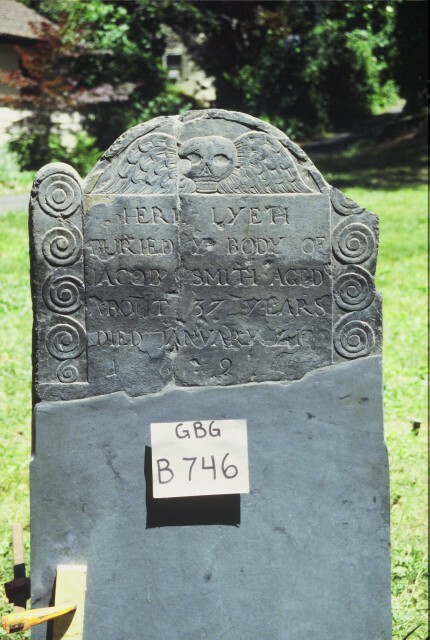 4.1.9 Harrington, 1795, Slate Headstone, Olde Burying Ground, Lexington, MA. Mending broken marker on site. 4.1.9 William Webber, ES, 1833, Old Burying Ground, Bedford, MA. 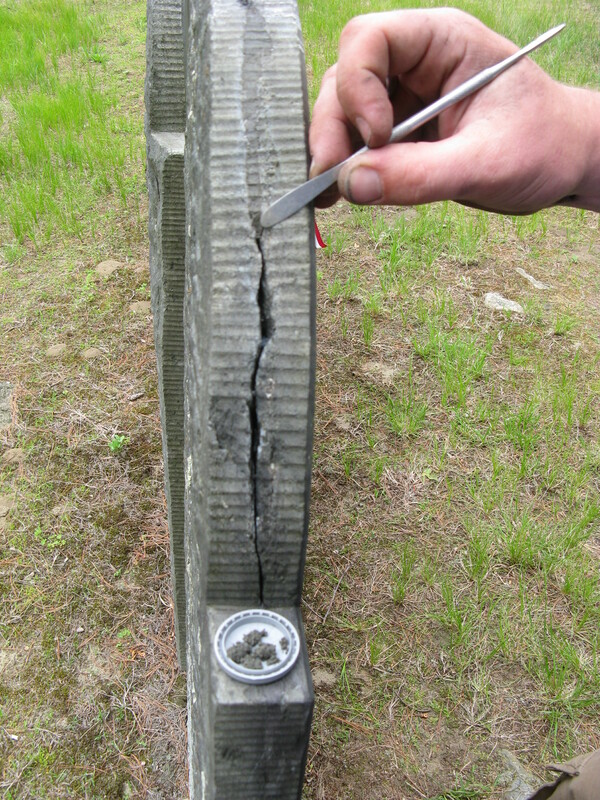 Cleaning top crack with compressed water. 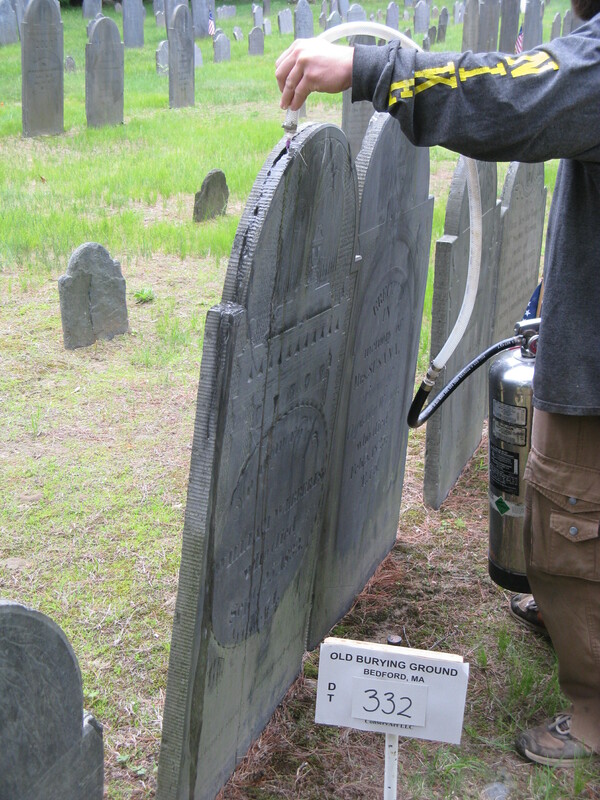 4.1.10 Childs Marker, 1811, Olde Burying Ground (1690), Lexington, MA. Resetting slate marker. 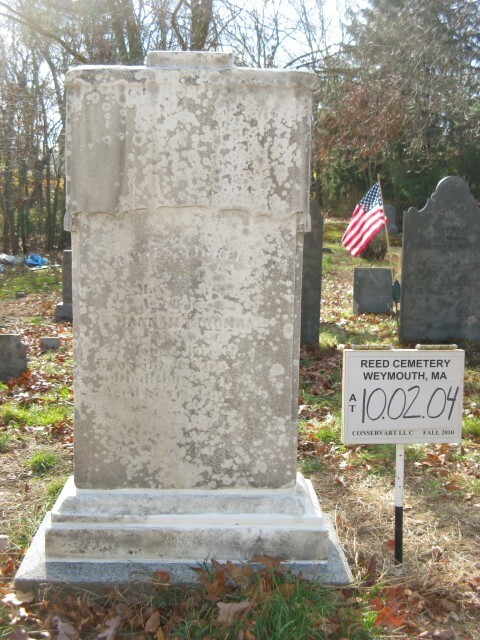 4.1.10.1 Leon Wood Family, 1841, sandstone, Olde Burying Ground, Lexington, MA. 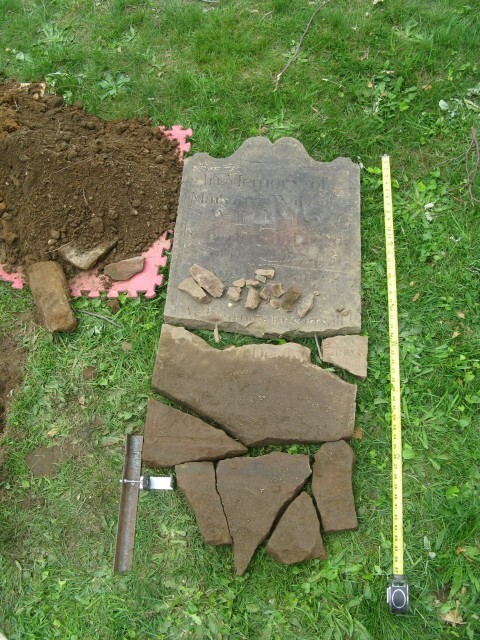 View of broken sandstone marker. 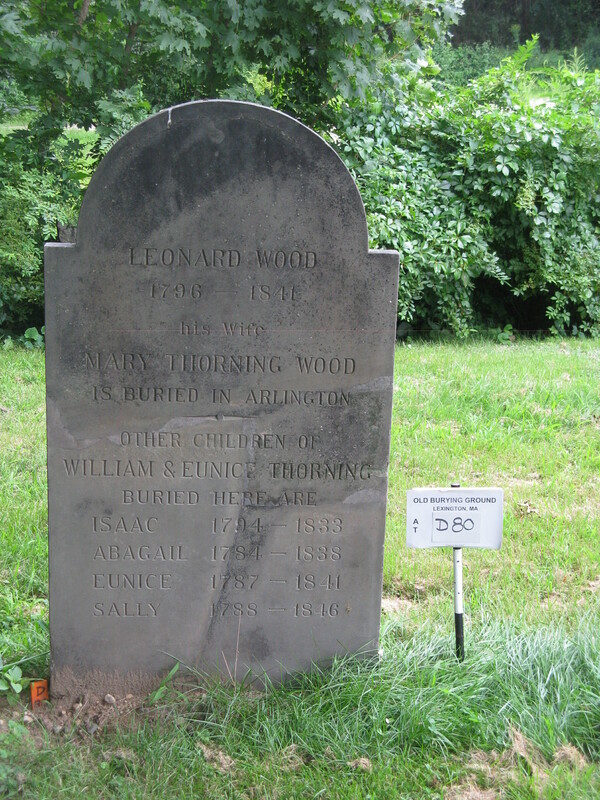 4.1.10.2 Leon Wood Family, 1841, sandstone, Olde Burying Ground, Lexington, MA. Color matched fills in break-lines. 4.1.10.3 Leon Wood Family, 1841, sandstone, Olde Burying Ground, Lexington, MA. Sandstone marker after treatment. 4.1.11 Rev. 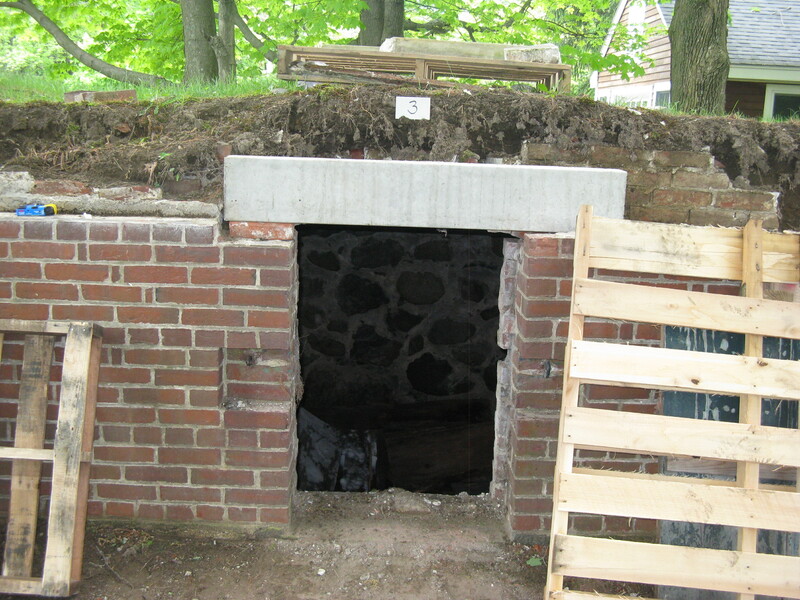 Chauncey Crypt, 1756, CT Valley Sandstone, Old Buying Ground, Durham, CT. Overview of top slab being picked from crypt. 4.1.12 Rev. 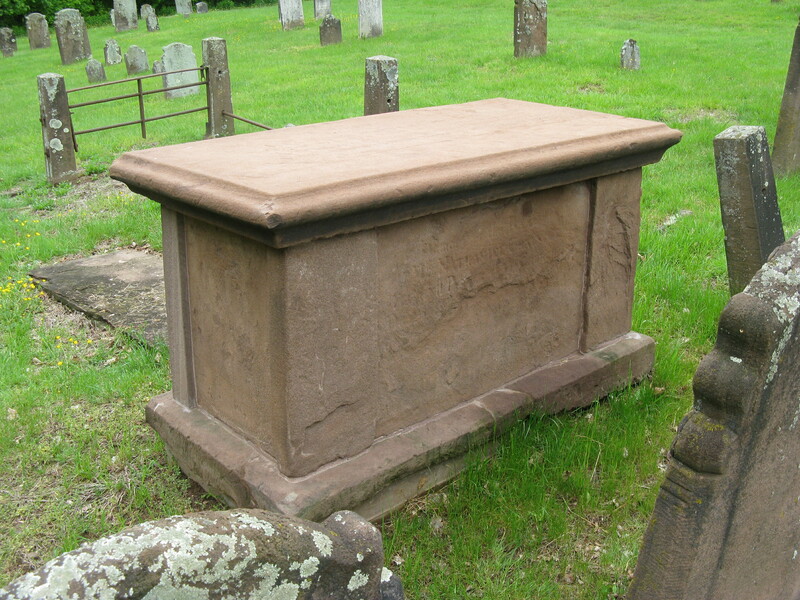 Chauncey Crypt, 1756, CT Valley Sandstone, Old Burying Ground, Durham, CT. Overview after treatment. 4.1.13 1760, Old Burying Ground, Durham, CT. Cleaning with quaternary ammonium cleaning agents without scrubbing stone. 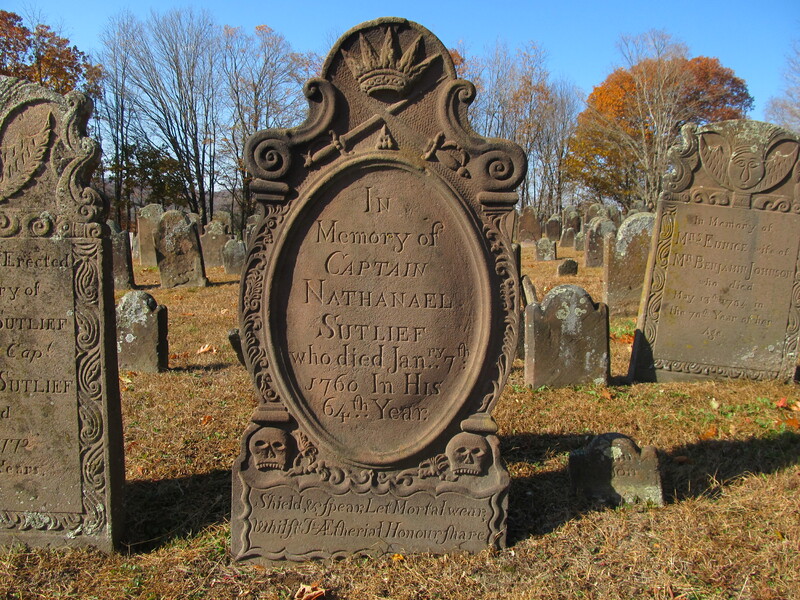 4.1.14 Wadsworth Family Monument, 1816, old Cemetery, Durham, CT. Marble includes commemoration of General James Wadsworth, Continental Congress, 1784. 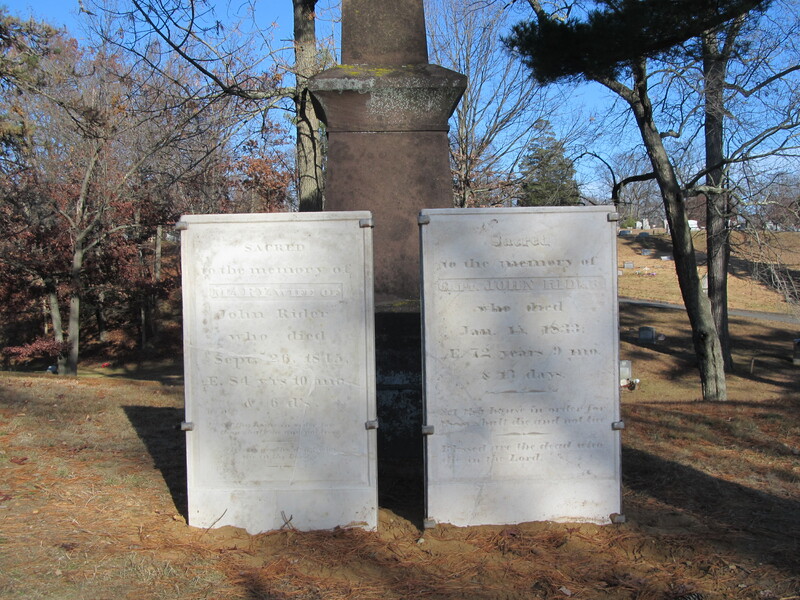 4.1.15 Wadsworth Family Monument, 1816, old Cemetery, Durham, CT. Marble includes commemoration of General James Wadsworth, Continental Congress, 1784. 4.1.16 St. Paul's Church National Historic Site, Cemetery, 1704, Mount Vernon, NY. Overview of site. 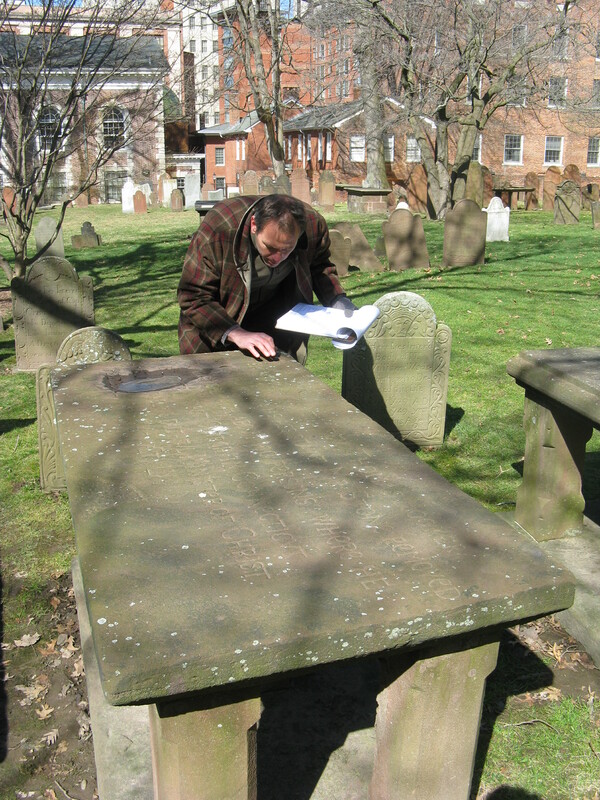 4.1.17 Betts, 1773, red sandstone, St. Paul's Church National Historic Site, MT Vernon, NY. Detail of screen showing found fragments. 4.1.18 Betts, 1773, red sandstone, St. Paul's Church National Historic Site, MT Vernon, NY. Dry fit of major fragments. 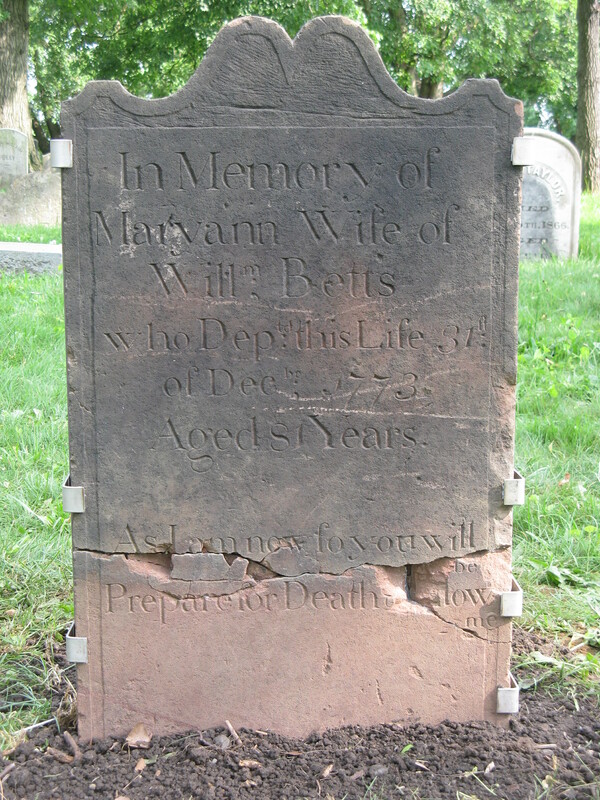 4.1.19 Betts, 1773, red sandstone, St. Paul's Church National Historic Site, MT Vernon, NY. Overview after setting. 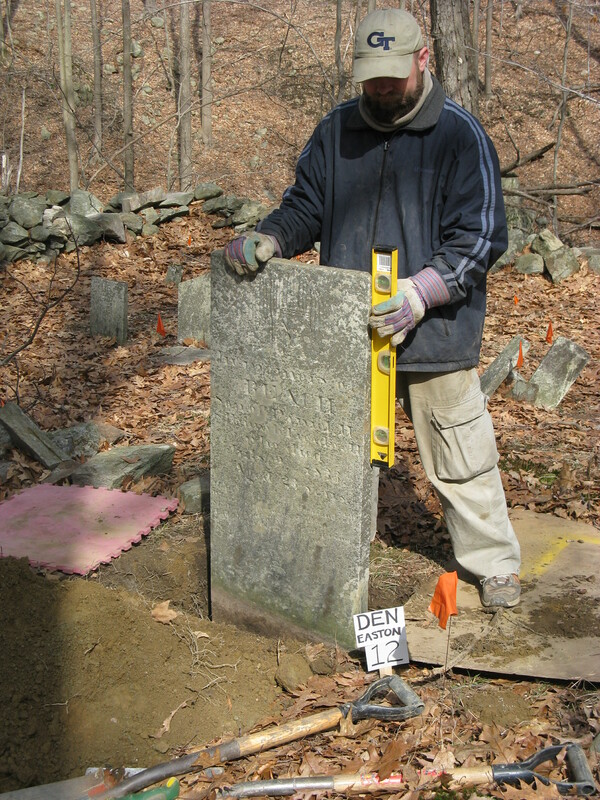 4.1.20 Tomb Lintel, Old burying Ground, Bedford, MA. 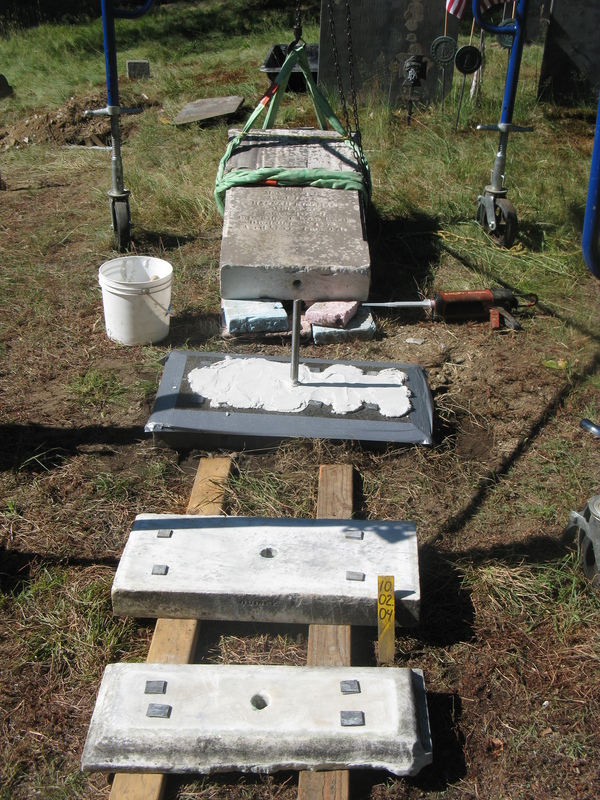 View of conserved marble lintel. 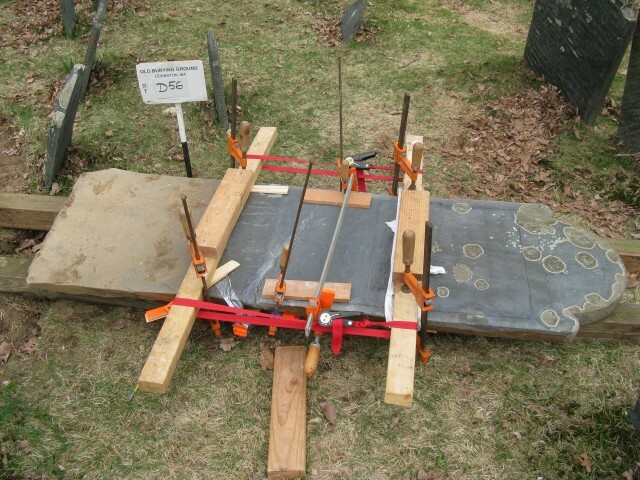 4.1.21 William Webber, ES, 1833, Old Burying Ground, Bedford, MA. 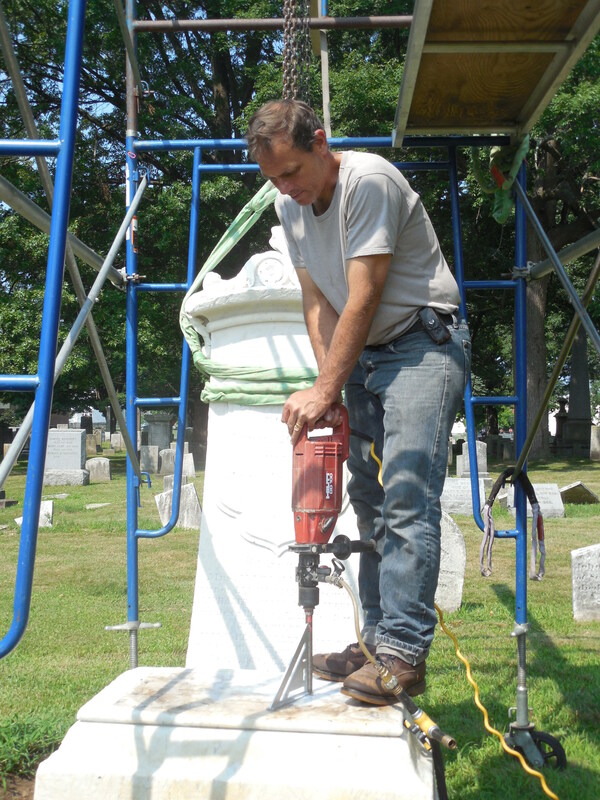 Filling top crack with color and aggregate matched mortar. 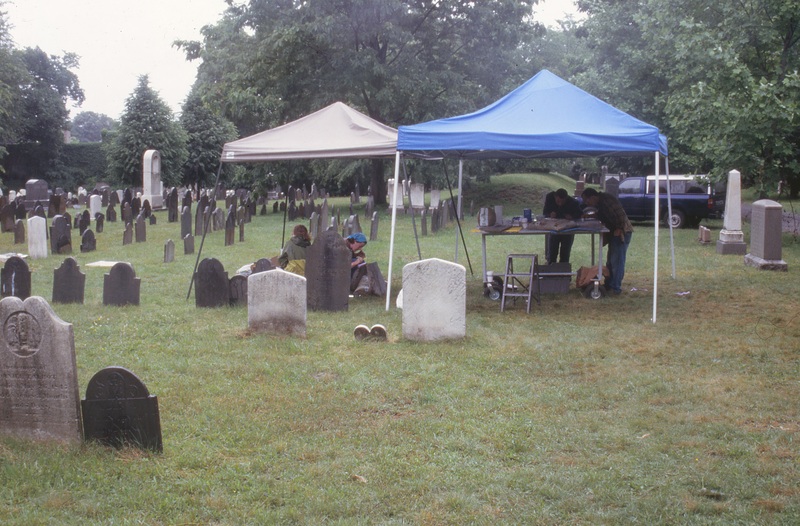 4.1.22 Hillside Cemetery, 1726, Cheshire CT. Overview of selected cleaning with quaternary ammonium cleaning agents without scrubbing stone. 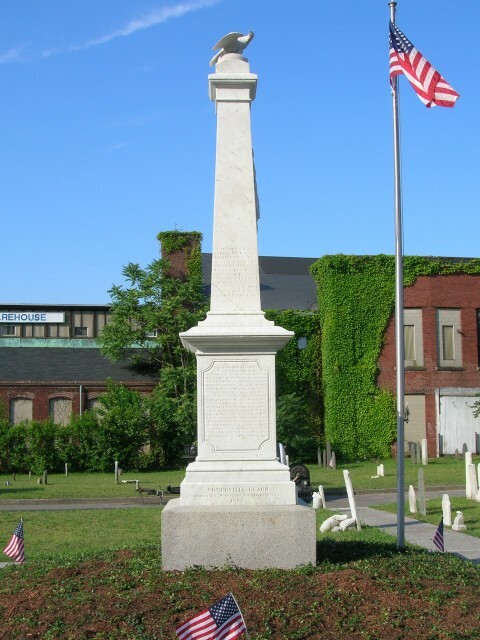 4.1.23 Milk Row Cemetery, 1804, Somerville, MA. Civil War Monument, 1862, after treatment. 4.1.24 Milk Row Cemetery, 1804, Somerville, MA. Civil War Monument, 1862, after treatment. 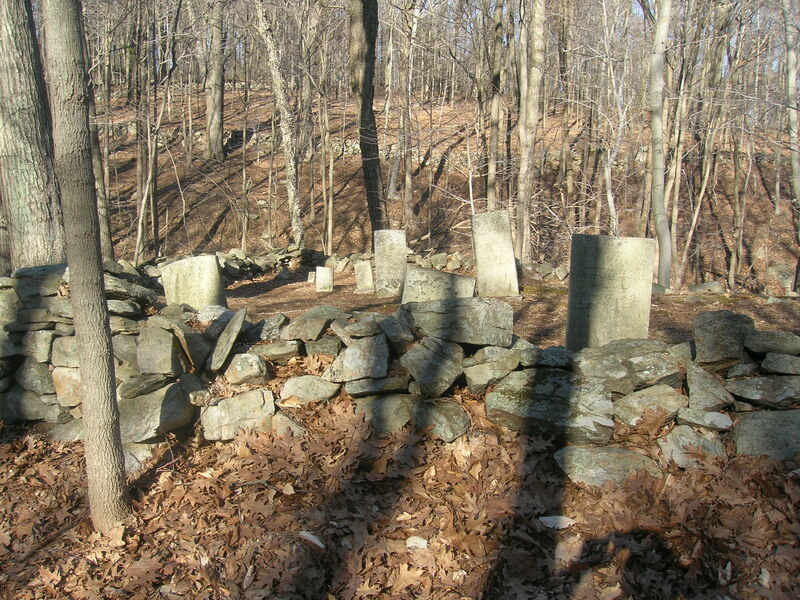 4.1.25 Den Cemetery, 1820, Easton, CT. Overview of cemetery to integrate whites and free blacks in CT.
4.1.26 Den Cemetery, 1820, Easton, CT. 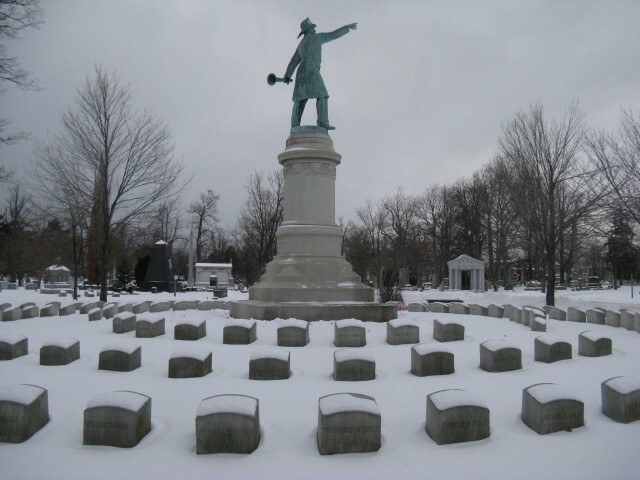 Setting marker in cemetery to integrate whites and free blacks in CT.
4.1.27 Red Jacket Monument, Hamilton, 1890, Forest Lawn Cemetery, Buffalo, NY. 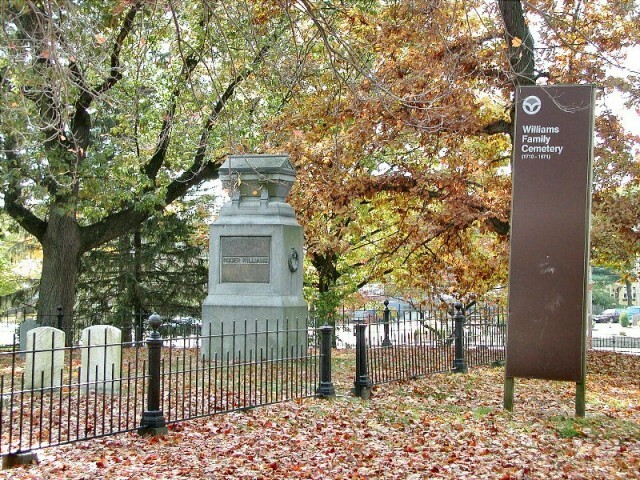 Overview of monument after conservation treatment. 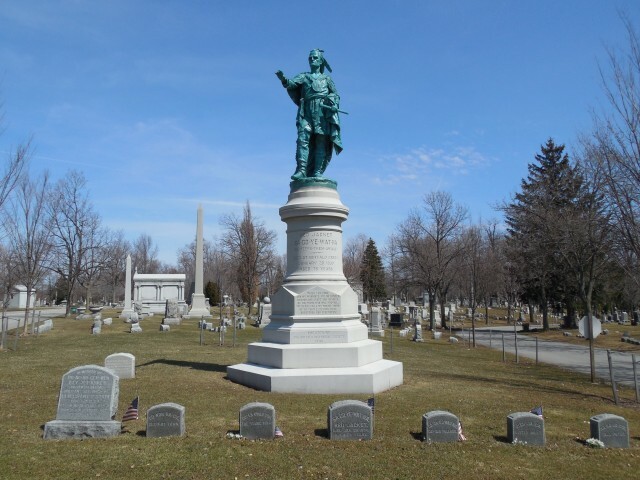 4.1.27.5 Volunteer Firemen Monument, 1091, Forest Lawn Cemetery, Buffalo, NY. Monument and 87 markers for fallen firefighters. 4.1.28 Letchworth-Skinner Mausoleum, 1872, Forest Lawn Cemetery, Buffalo, NY. Overview of structure during assessment of bronze and interior objects. 4.1.29.0 Bowles Monument, 1813, Old North Cemetery, Hartford, CT. Unstable brownstone obelisk. 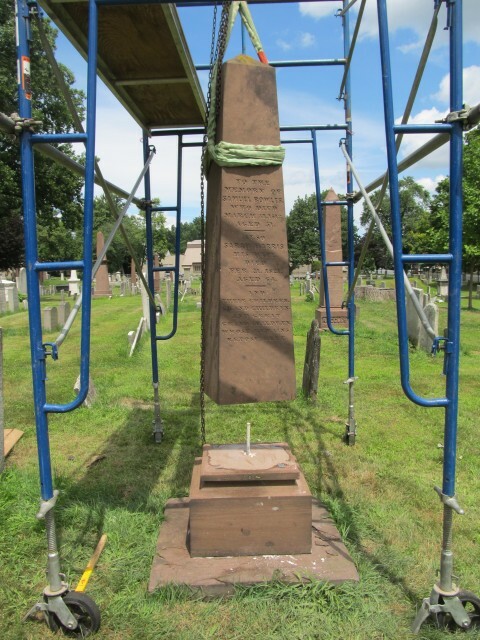 4.1.29.1 Bowles Monument, 1813, Old North Cemetery, Hartford, CT. Resetting brownstone obelisk. 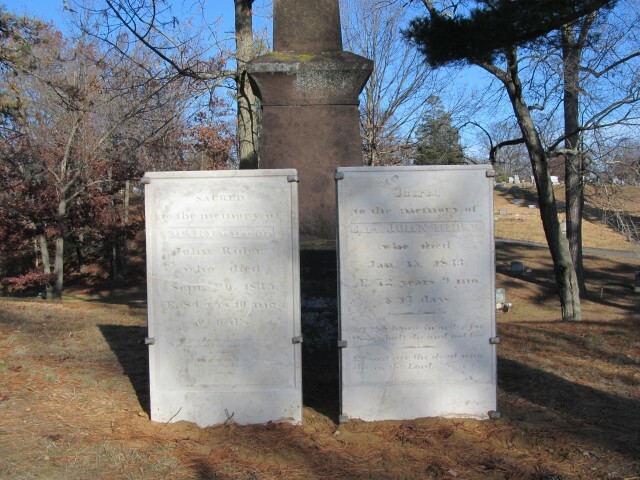 4.1.29.2 Sheldon and Royse, 1813, Old North Cemetery, Hartford, CT. broken and fallen monument. 4.1.29.3 Bowles Monument, 1813, Old North Cemetery, Hartford, CT. Repairing marble. 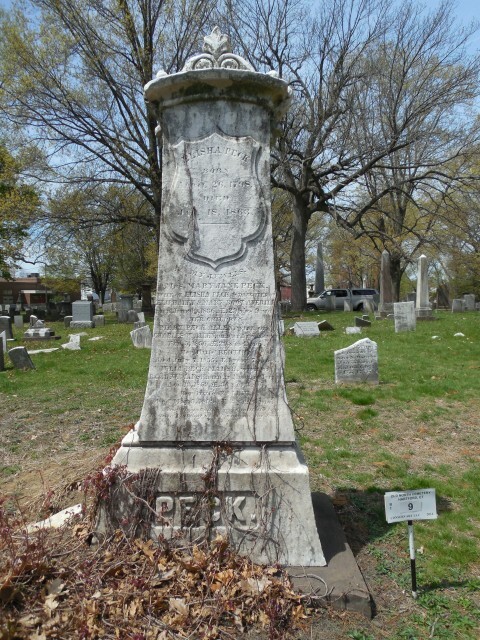 4.1.29.4 Peck Monument, 1863, Old North Cemetery, Hartford, CT. Unstable and soiled monument. 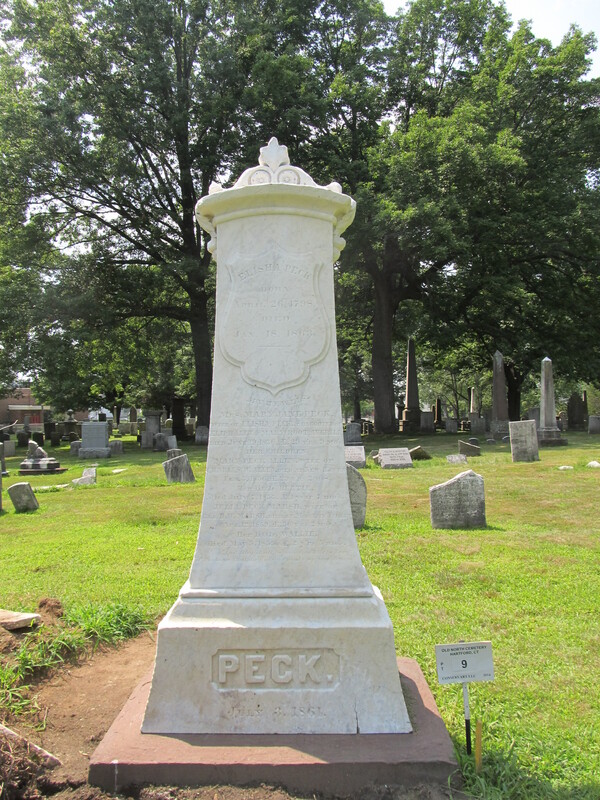 4.1.29.5 Peck Monument, 1863, Old North Cemetery, Hartford, CT. Core drilling for stainless pins. 4.1.29.6 Peck Monument, 1863, Old North Cemetery, Hartford, CT. After cleaning and resetting. 4.1.30 Welles Monument, 1846, Old North Cemetery, Hartford, CT. Resetting granite monument. 4.1.31 Volunteer cemetery cleaning emphasising no scrubbing of fragile stone. 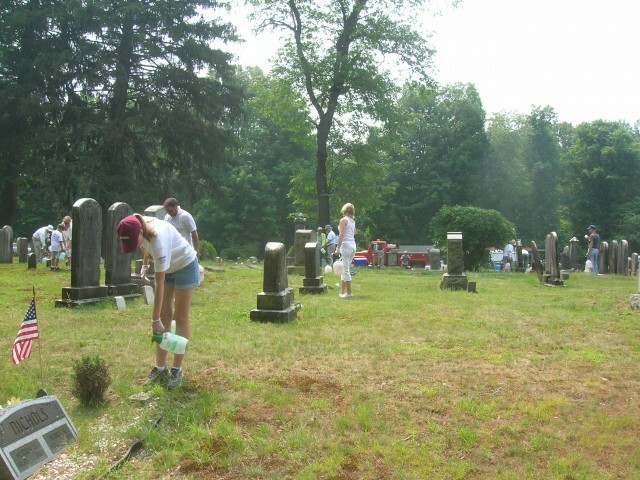 4.1.32 Volunteer Cleaning Campaign. 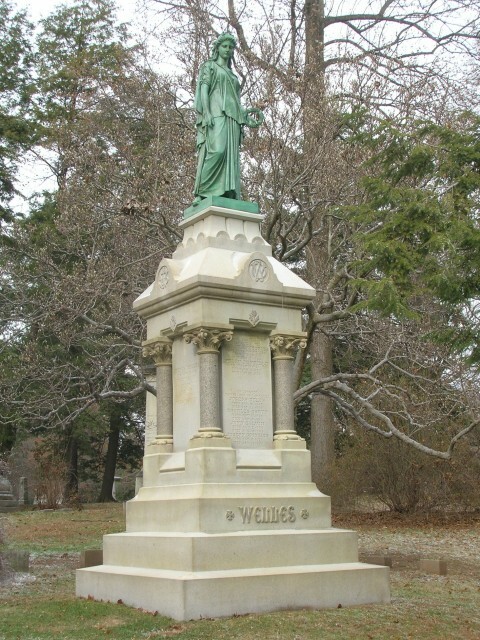 Center Cemetery, Easton, CT.
4.1.33 Welles Monument, Charles Conrads, 1873, Cedar Hill Cemetery, Hartford, CT. Overview after conservation treatment. 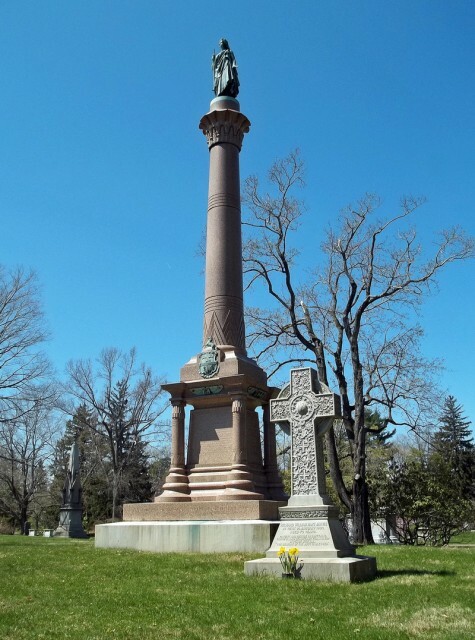 4.1.34 Colt Monument, Randolph Rogers, 1894, Cedar Hill Cemetery. Overview of bronze and stone. 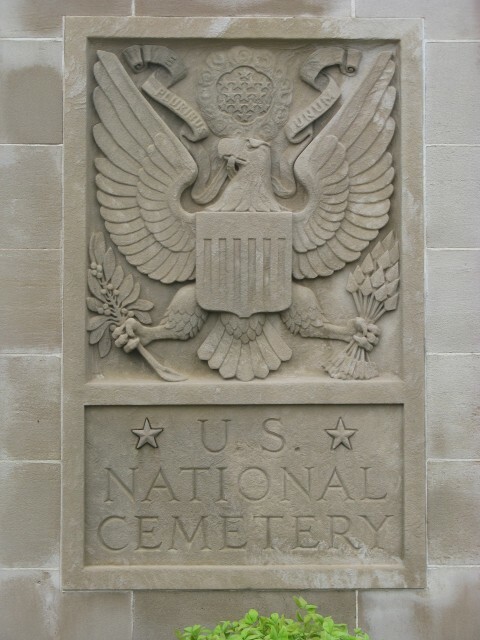 4.1.35 Entry Gate, Fort Smith National Cemetery 1867. 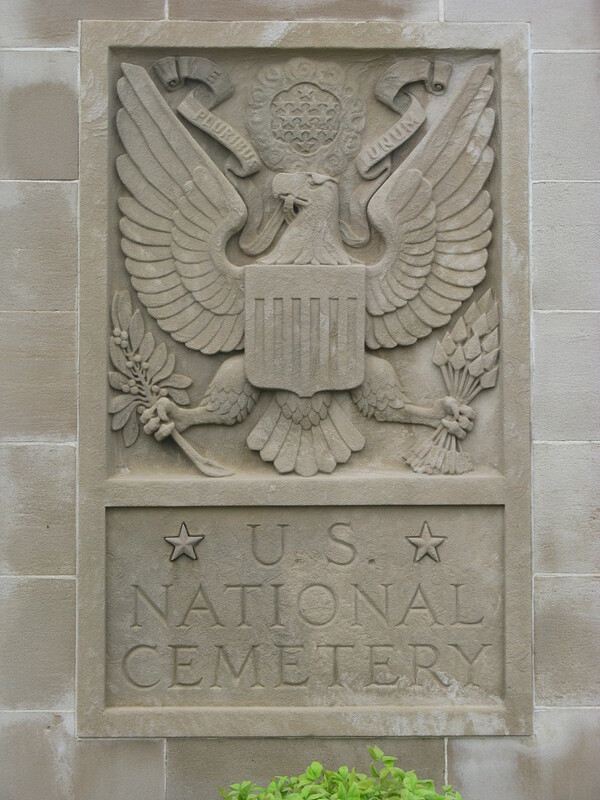 Front overview of the relief emblem designating the National Cemetery. 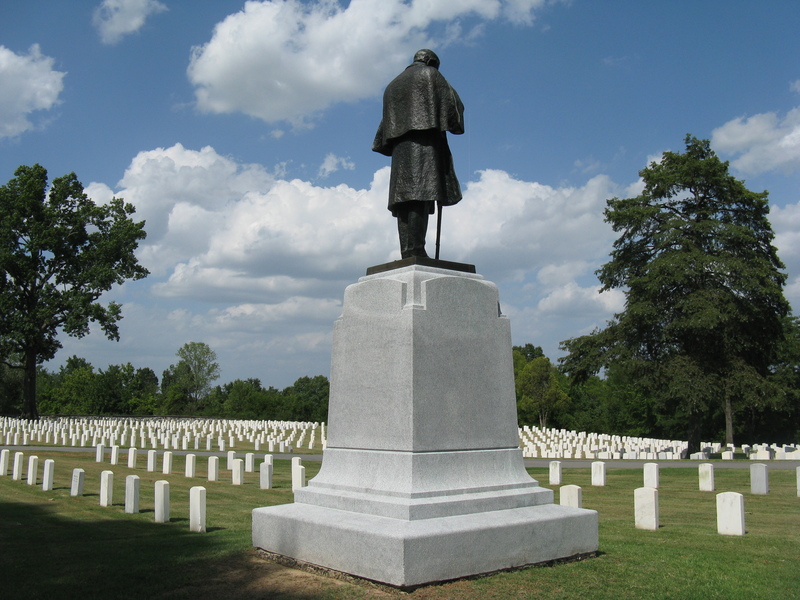 4.1.36 Confederate Dead Monument, Fort Smith National Cemetery, Fort Smith, AR. 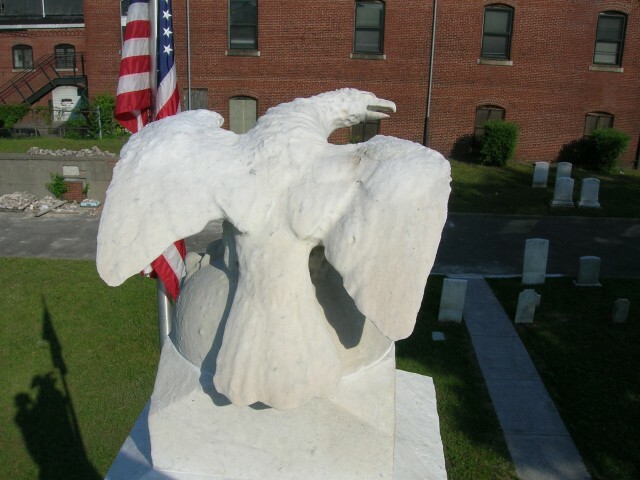 Overview of the marble monument. 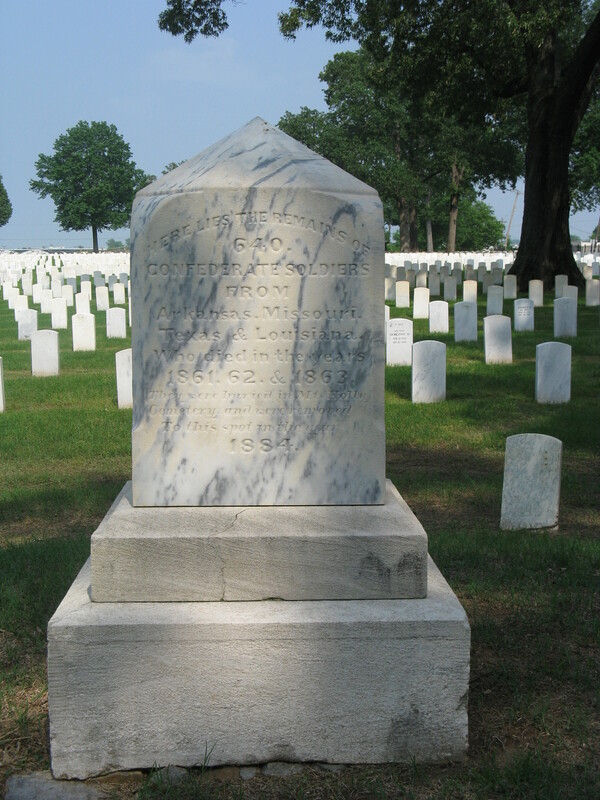 4.1.37 Confederate Monument, 1884, Little Rock National Cemetery-Front overview of marble memorializing 640 Confederate dead buried at the site. 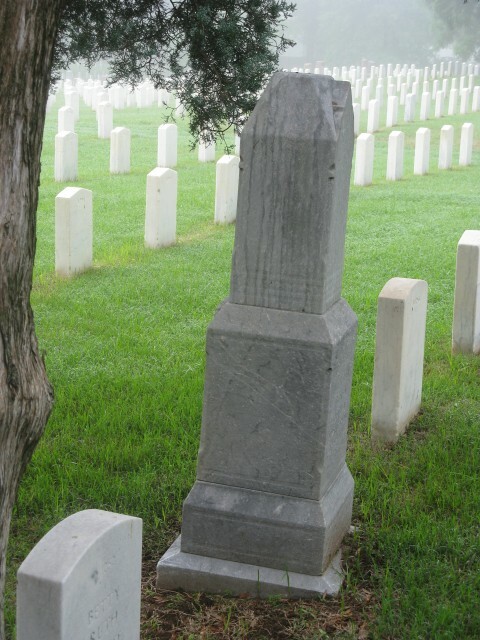 4.1.37 Minnesota Monument, John Daniels, 1916, Little Rock National Cemetery, AK. 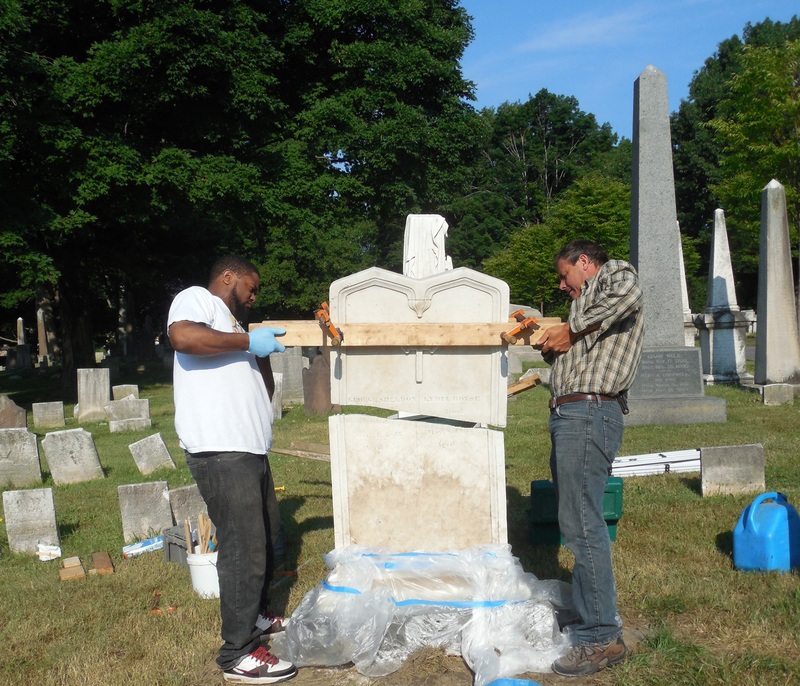 Proper right overview of monument after conservation treatment. 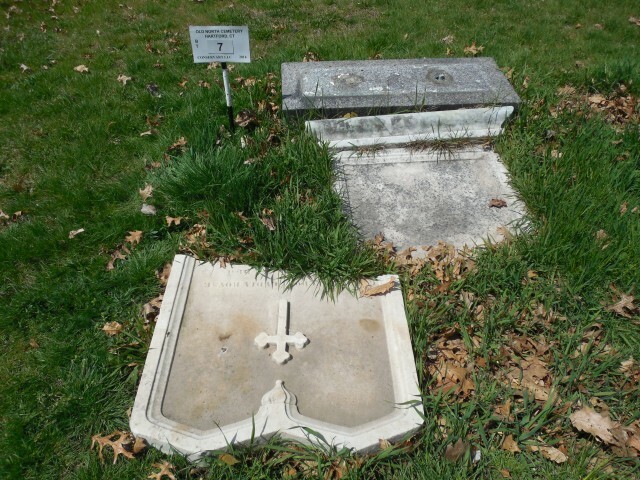 4.1.38 French Cross, Unknown, 1920, Cypress Hills National Cemetery, NY. Back overview during assessment. 4.1.39 Reed Cemetery, 1769, Weymouth, MA. 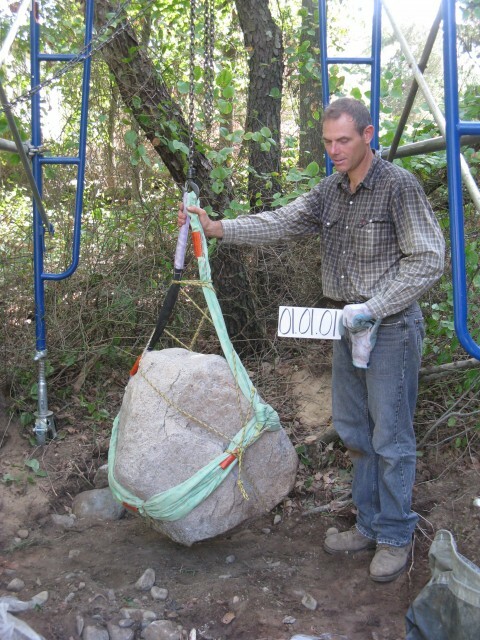 Resetting boulder marker. 4.1.40 Reed Cemetery, 1769, Weymouth, MA. Reset boulder marker. 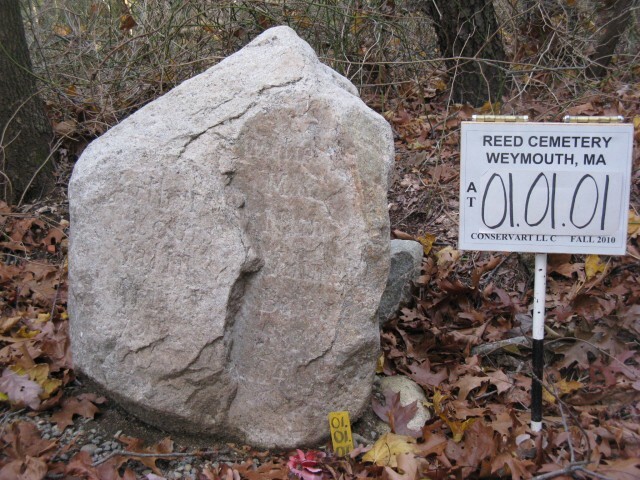 4.1.41 Reed Cemetery, 1769, Weymouth, MA. Monument prepared for assembly with stainless steel and lime mortar. 4.1.42.4Reed Cemetery, 1769, Weymouth, MA. 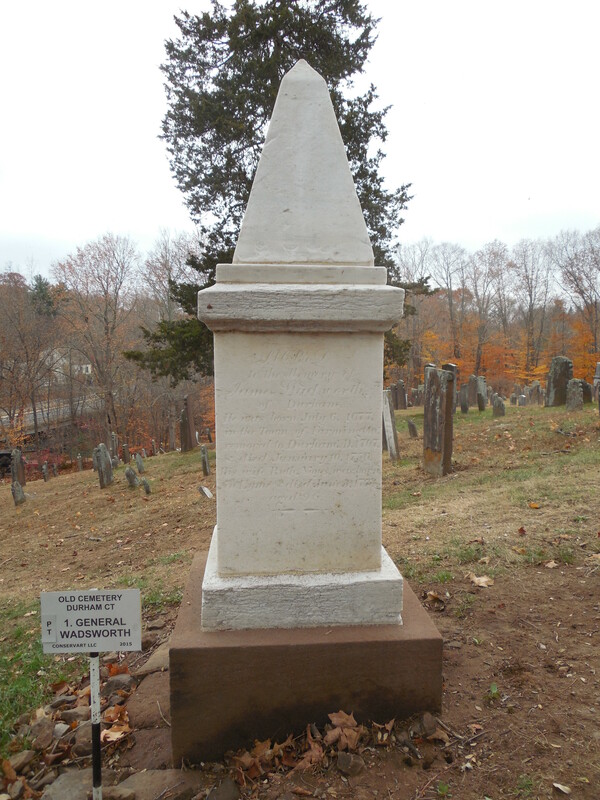 Monument after treatment. 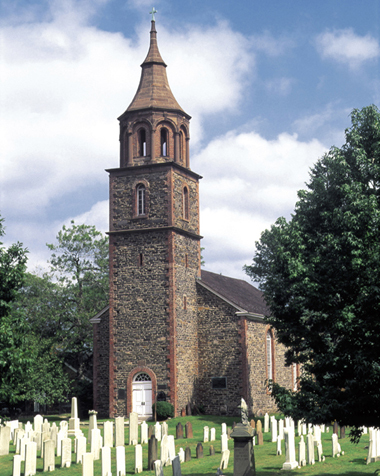 Austere colonial burying grounds, small family plots, grand rural cemeteries and state and national cemeteries honoring those that served our nation, give dignity and grace to country roads, townships and urban centers, providing a wealth of historic, artistic and spiritual benefit. Markers range greatly in age, style and materials. 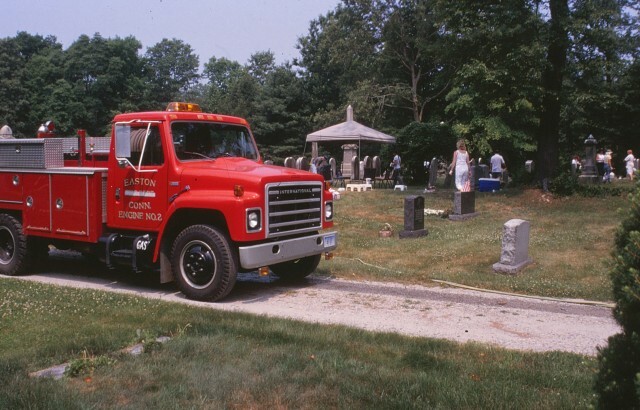 From small, local rubble or single slab headstones in schist, slate or sandstone, to large ornate monuments in marble, limestone or granite, stone markers and structures are endangered by physical damage, chemical decay, loss and, most unfortunately, senseless vandalism. 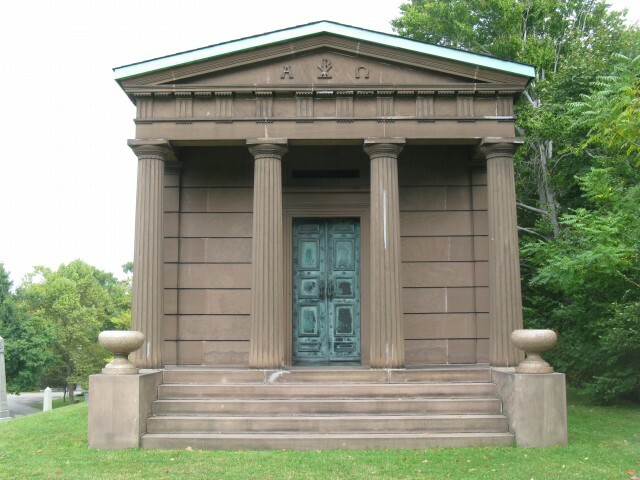 Cast iron, wrought iron, brass, bronze and zinc also play an important roll in cemetery design, providing the fundamental materials for surrounding fences, gates, doors, architectural embellishment, sculpture and monuments. Corrosion, fatigue, external stress or impact threaten the longevity of metals. Theft for scrap metal threatens complete loss. Historic cemeteries don’t simply include the obvious markers and architecture in stone and metal, but also include the surrounding small plants,shrubs, trees, roads and other elements of the landscape. 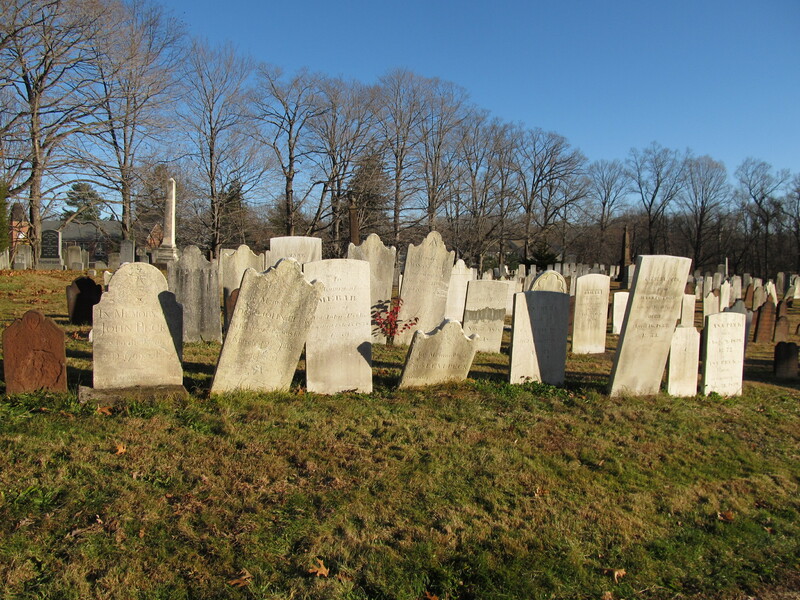 Many early, colonial cemeteries took shape in an organic fashion, expanding outward in uneven rows and shapes. Later designs were primarily based on the utility and the economy of the grid system. 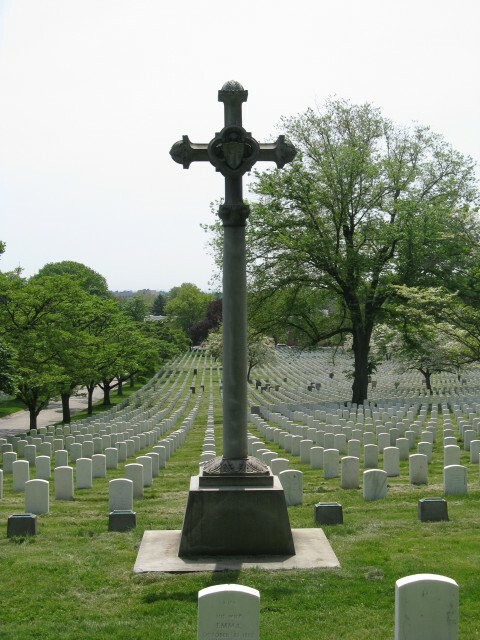 Both of these cemetery types have natural small growths and wildflowers that provide intrinsic beauty and harmony. Intentional plantings by the cemetery caretakers, family members and loved ones add a social complexity and spiritual richness. The grand Rural Cemetery Movement started by Mount Auburn in 1831 changed the cemetery landscape completely into a sophisticated planned design, of earth, water, plants, markers, walks and roadways. 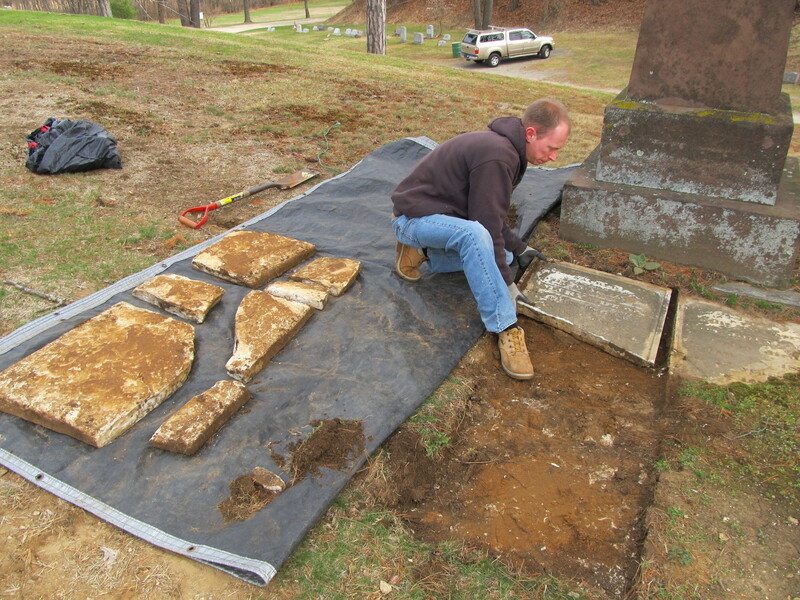 The preservation of a historic cemetery may require a wide range of expertise including advice from historians, landscape architects, botanists, conservators and maintenance professionals – all well versed in the unique qualities of the cemetery at hand. The development of a preservation plan is highly encouraged for long term care of these complex sites. 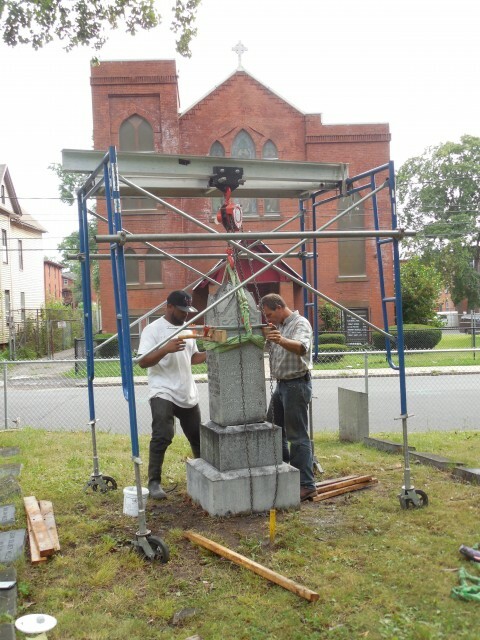 An emphasis on preservation of the object in unity with the landscape should help shape the overall plan, particularly for historic sites on state and national registries. The design and implementation of the marker treatment should be thoughtful and site specific. The use of gravel for resetting markers should be evaluated by examining the soil types and determining the reason for current instability. The introduction of foreign materials is often not beneficial. 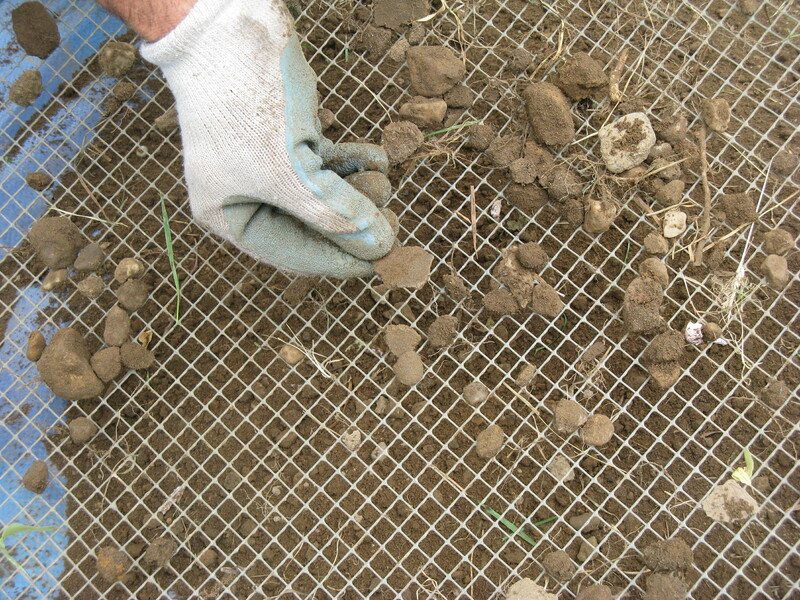 The need for cleaning should be evaluated for each site and implemented in the least aggressive means possible. The development of quaternary ammonium cleaning solutions allows for cleaning of fragile surfaces and significant historic markers without scrubbing or mechanical action. 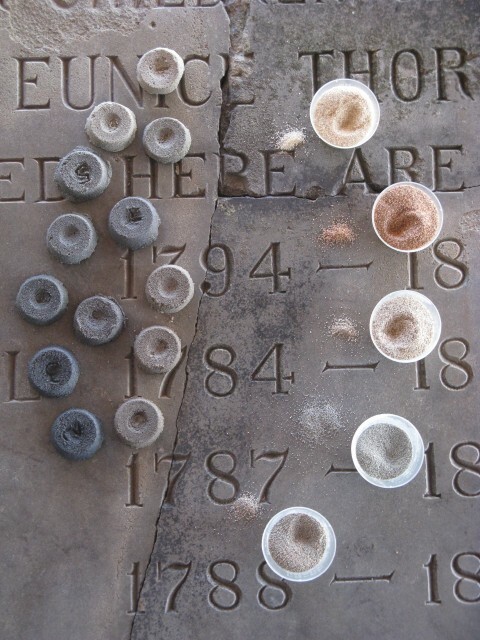 Treatments should be made with materials that are compatible with aged stone types and aesthetically harmonious by appropriate color matching and use of like stone, stone dusts and aggregates, finished to match the color and texture of the original. 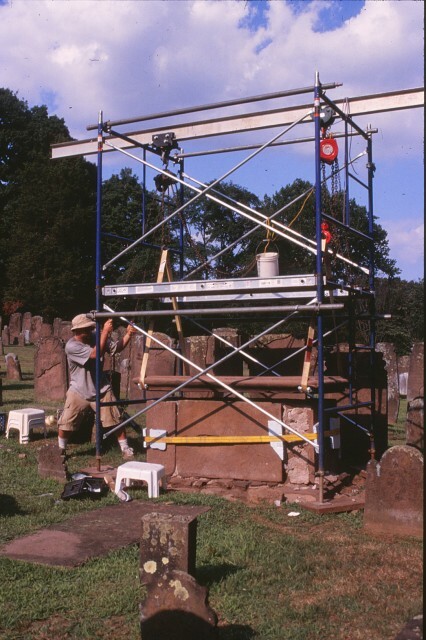 Whether the historic markers are stone, metal, cast stone, or concrete, the fundamental principles of conservation, as outlined in other pages of this site, should help guide treatment. Insightful planning and implementation of informed preservation efforts will preserve these threatened landmarks for future generations.